My daughter joined me in the Chapel this morning. She worked on the vineyards as I continued with the crowds outside of the two windows. Father came to visit with us for a short time and a mother stopped by to tell us that just before our arrival, there were no fewer than thirty grade two youngsters in the space…looking at the wall…as they were taught about the symbols of the wine and the bread in preparation for their first Holy Eucharist. From there, they were seated in the church itself, rehearsing and learning about this huge opportunity. The two of us were happy to be listening to the teaching voices and the voices and laughs of children while we worked. We quietly spoke to one another and wondered about The Last Supper as we painted. It was a treasured time for me…it meant so much for her to be sharing this space with me…and for her to be painting. 1. In karate, start with a bow and finish with a bow. 2. No initiative attack in karate. 3. Karate is a great assistance to justice. 4. Know yourself first and then others. 5. Spirit first, techniques second. 6. Be ready to release your mind. 7. Accidents come out of idleness. 8. Do not think that you can learn karate only in the dojo. 11. Karate is just like boiling water, if you do not give heat constantly, it will again become cold water. 12. Do not think you have to win. Think, rather, that you do not have to lose. 13. Victory depends on your ability to tell vulnerable points from in vulnerable ones. 15. Consider your opponent’s hands and feet as you would a sharp sword. 16. As soon as you leave home for work, think that millions of opponents are waiting for you. 17. Low stance for beginners; natural stance for advanced students. 18. Practicing a kata is one thing and engaging in a real fight is another. 19. Do not forget [a] strength and weakness of power [b] bending down and the stretching up of body [c] slowness and speed of techniques. Tonight in the black belt training, we practised Niju Shiho. It can be viewed on one of these videos…quite amazing really! It is sunshine to see gardeners gardening and to see all the folk in the neighbourhood out doing their work. It is nice to have conversations on the sidewalk with people who have been nesting all winter and spring…to wear short sleeves and sandals in the warmth! 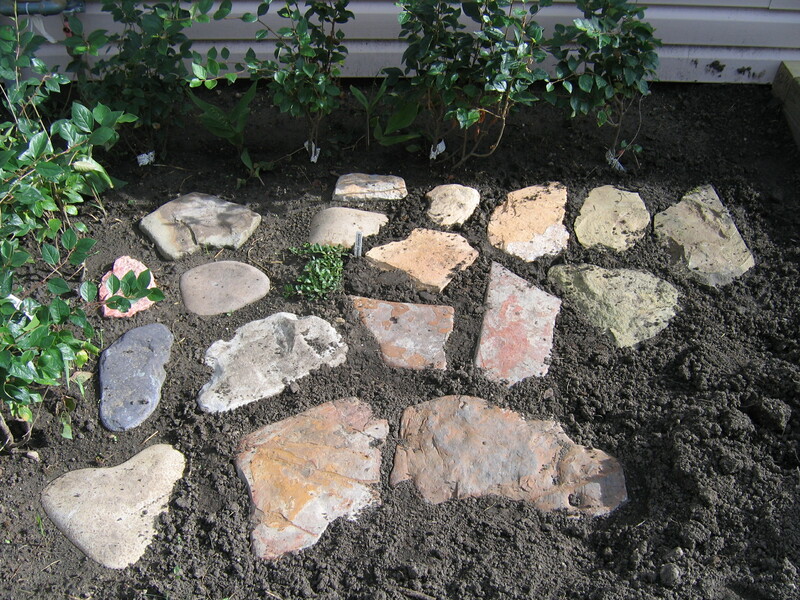 Here is a picture of my friend’s garden…the beautiful stones painted by loving thoughtful hands! What a glorious combination of beautiful things….plants coming to life and art…an expression of an artist! I want to do something about the plight of the citizens of this African region. The situation in Sudan has been escalating for years! 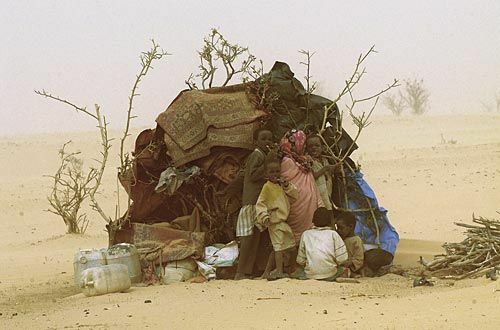 I am pleading with you to contact your Canadian MPs to do more to stop the humanitarian crisis in the Darfur region of Sudan…such displacement and killing! Perhaps you have noted that to some degree, I am an idealist. And yes, I can sit back and agree, what can one person do? But I am also objective when I say that there are things within our power as human beings that we can do. Years added to years can do a couple of things…it can cause you to become more and more self-centered OR it can cause you to formulate a legacy. It is for each individual to choose to create ‘magic’. This morning, I am urging you to look outward, whether you are a person who has significant power in the business world OR someone who writes poems late at night, after serving drinks in a bar…please become aware of the status of families and children in Africa and now, particular to the Darfur region. This crisis looks to be genocide….again! Write a letter and apply pressure on your political representatives and do not remain silent! I love the springtime for the wee little sprouts of things! I love working in the soil, using my bare hands to break apart the cool clumps of earth! I often think that I was intended to be solely a planter, but find that at the very least, this small garden plot brings me closer to my own spiritual roots. For the most part, I plant perennials and have selected them so that no matter what time of season, there is colour and typically there are contrasts…just like my paintings…yellow set out against violet…orange against blue. For now, there is the simplicity of evening sun setting over turned soil, a rich warm colour in the light. Last year I turned bags of manure in and this weekend I will turn in a bag of Peat Moss. 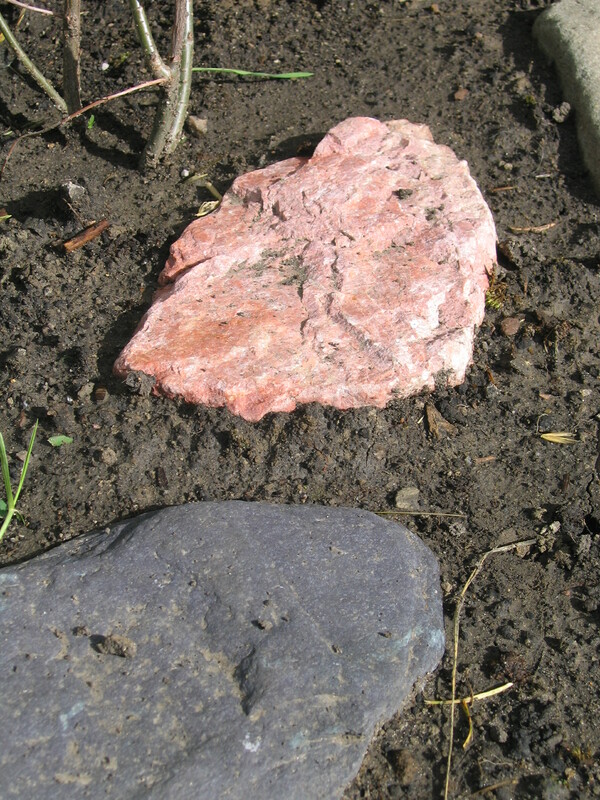 Placed in the garden, are some ceramic tiles created by my youngest daughter while she studied at Art College. I love to intersperse sculpture with garden spaces, and I want to develop more of that over the years as I create a personal landscape. Down at the ‘big house’ I had many beds to plant…in fact, I have planted, no matter my circumstance. Another rite of spring that I will observe this weekend is to locate my first crocus of the season…something that is very special to me. It IS officially my firstborn’s birthday and so it is only appropriate that I should write a garden entry in celebration of her life! Happy Birthday, my beautiful daughter! I painted for four hours this evening in the Chapel and feel as though there is real progress being made. I met two women after Mass, one who spent about an hour with me in prayer and the other who simply affirmed the project, the ideas and expressed warm gratitude. I was very happy about the contact. The choir was practising in the church while I painted. I loved hearing the music and sang along for the most part, all the while reaching hard-to-reach-places on the high ladder. A group of young and interested children visited again and again, watching the progress and entering in wonderful conversations. This gave me the opportunity to share some of what I was doing. Small Maria added her name in gold, while the others signed the handwritten journal I have been keeping. Return to the Chapel, Painting and Karate! It is a day of celebration really! My friend had a baby son last evening; word has it that both Mom and baby are healthy! I am in awe of such miraculous events…so very happy! I spent yesterday with my friend, divining in the countryside…a beautiful day of cool breezes and warm sunshine…snuggling a pregnant donkey, pregnant cats…watching dancing calves darting about, tugging at their mothers and imitating the big ladies filing after their hay. The whole world is pregnant with spring…it is a lovely time. 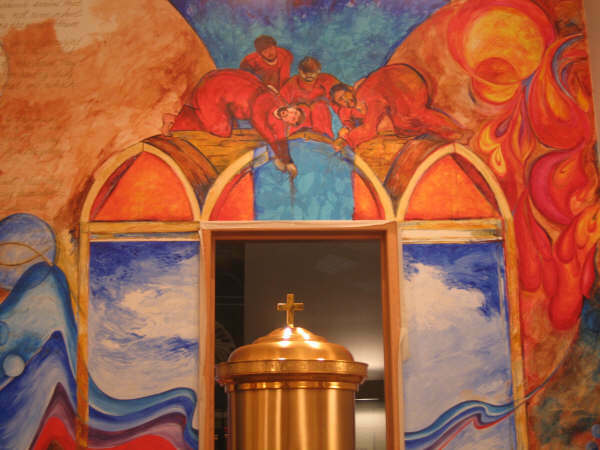 I spent two hours painting in the Chapel this evening after almost two weeks rest and rejuvenation. It is a wonderful Easter…butterfly motifs woven throughout the church building and lilies and flowers everywhere! (I am still amazed that just days ago, I saw a field of calla lilies in full bloom in the southern United States.) The water flows in the baptismal font and so as I painted this evening, it sounded much like the creeks of yesterday. I am filled with positive thoughts, notions and experiences and expect all of that to continue as I head out to a good session of karate. I found the poem I was looking for on steve and sara's proposal page. Sweet! I’m back! I’ve returned from a drive through paradise…seen places I’ve never seen and seen places I HAVE seen, differently. It was a dream-like adventure, that’s for sure! I climbed up into the cab of a long-hauler’s truck seven days ago and drove through six States…delivering to a spot called San Luis, Arizona….picking up a load in LA and arriving home last evening….and oh my! The places and spaces between! Spectacular. I am awe-inspired…as an artist, a friend and as a spiritual being. It’s appropriate to celebrate earth day today…I’m feeling so blessed and overcome by the beauty that is so apparent everywhere! Let’s do what we can as individuals to protect this precious commodity…because that is what the earth has become…a commodity. It’s necessary for all to live their lives consciously…inventors, politicians, artists, trades people, corporate leaders, teachers….it is absolutely imperative that our resources not be taken for granted. I’m going to now open up a new photo album here…try to post some photos that capture, at the very least, some sense of landscape. I will title the photo album, "Oh, The Places You’ll Go! ", a Dr. Seuss book. Holy Week began with Palm Sunday…a beautiful celebration commemorating the entrance of Jesus into Jerusalem. The reading of the Passion of Christ was followed by a talk including observations that sometimes Christians do not stand up for their faith and for their principles in today’s world. I am of the mind that it is for us to explore, question and dig deeper…ever-seeking a closer and authentic relationship with God who loves us. We can not expect to be spoon-fed or go blindly, without a sense of responsibility to this special relationship. I would like to thank those of you who encouraged me while showing step-by-step what my Lenten journey involved in my painting and in my exploration of scripture. 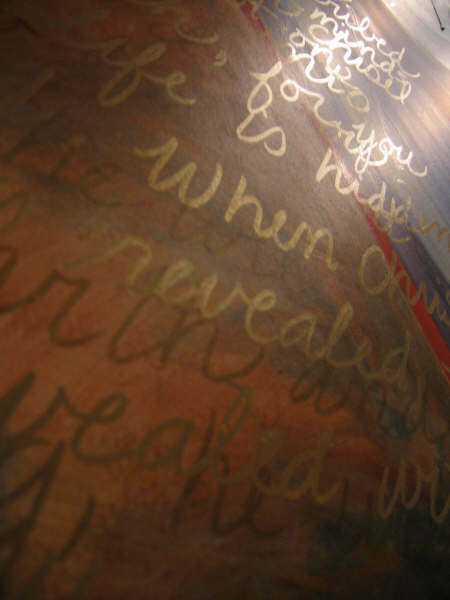 I will continue to paint, but in a less structured way, until the piece is completed in the Chapel. When I DO paint, I will publish photos of the ongoing progress. Tonight I have rested…and I will again tomorrow night. On Thursday I will observe the washing of the feet and spend time in prayer afterwards, in the presence of the Blessed Sacrament. Likely this will be my last entry until after Easter and so I am wishing everyone here a very blessed and prayerful reflection…of the Cross…the Passion and finally and forever, the Resurrection! While relaxing this evening I watched the movie, Water by Deepa Mehta. An exquisite film…beautiful and powerful..an important story to be told! Closing thoughts…when it can be found inside ourselves, we can be kind to others. We can show compassion. We can be generous. We can have a spirit of goodness in all that we do. We have this moment. We can give something rich and wonderful to the world, or we can share those emotions, words and actions that are rooted in fear. It is for each of us to unlock the answers within our own hearts.